Is it possible to choose the background wallpaper for my Win 7 computer desktop? How to do that? Re: Setting up desktop wallpaper for Windows 7 computer? Yes, it is possible to set up a desktop wall paper for your window 7 computer. For this you will need to follow some simple steps. You need to right click on the desktop. Then you will be able to see a menu pop up. The last option on the menu would be “Personalize”. When you click on personalize, you will be able to find a new window with lot of options. One of the options would be Desktop background. When you click on that there will be an option to select the desired image and also the alignment needed for the image. It is very easy to do, Just go to your photo that you want to make your wall. u can do it with two different steps. first go on desktop screen . there rigth click , it provide u list choose "personaliz". then it show a box choose ur background theme in it n double click on it. now right click on is and select set as background. 7. save he changes and apply the changes. You will get options such as view,sort by, refresh etc... and at the end you can find a option as personalize, select that option. When you click on that option a new window gets opened. In that window at the bottom you can find options like Desktop Background,Windows Color,Sound,Screen saver. In that options select Desktop Background option. When you select that option you will be redirected to other page where you can browse the Wall paper from your system and set it as your Desktop back ground. After selecting the wall paper Save the changes by select Save Changes options at the bottom. Yes you can set a wall paper of your choice . 3)Choose "Set as Desktop Background" option . 4)You can than see that , the image is your new wallpaper. choose the last option-i.e personalize option. click on the desktop background which is at the bottom left corner. choose any background & save changes. you may also choose any particular picture as desktop background by right clicking on it & selecting set as wallpaper option. Yes, it is possible to choose the Background Wallpaper for Windows 7. Firstly, right-click on the desktop, then choose Personalize option. From here, you can change your wallpaper that will set on the desktop. yes,it's very easy to make the wallpaper for windows 7 computer. 2.Type regedit in the search box and press Enter. 5. In the right pane of the Desktop key in regedit, right click on the Wallpaper string value and click on Modify. 6. Type in the full path of the image file , and click on OK.
8. log off and log on to apply. its easy just right click on the desktop and click personalize a window will open in there there will be an option called desktop Background click it and then you can change it!! 1.Right click an empty area on the desktop.Click "Personalize". 2.Click "Desktop Background".Select the wallpaper from the drop down menu. 3.Click "OK" and then close the personalize menu..
To do the same just right click on to your desktop/Select Personalize Option (This will open a new window)/Now it will show you many wallpapers (You may pick any one of them according to your need), you could also use a group of wallpapers as slide show also from here. >>Everyone likes that his computer background should be his best or the favourite picture. 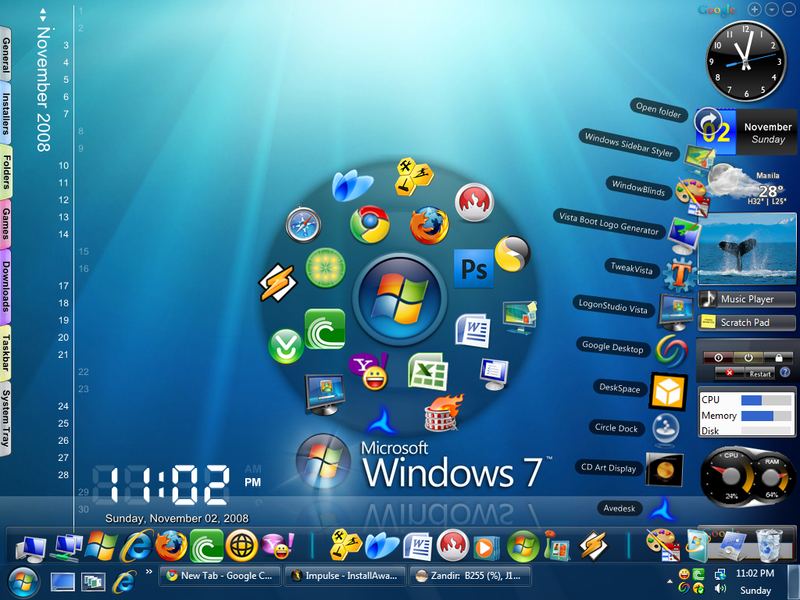 >>Windows 7 enables you with the option of changing the windows according to your wish. 1.Click on start button located at the lower most left hand side of the computer. 3.In the control panel Click on appearance and personalization. 4.In the new window under the personalization click on change desktop background. 5.Now in picture location choose pictures library. 6.Choose the picture you want to have as the background. 7.Then click on save changes and you are done. Right-click on the Desktop and hit on Personalize. Now select Desktop background under Personalize. Select the one that you want be your wallpaper. You can also select browse to take images from your PC. 1. Open Desktop Background by clicking the Start button and clicking Control Panel. 2. In the search box, type desktop background, and then click Change desktop background. 3. Click the picture or color that you want to use for your desktop background. 4.Under Picture position, click the arrow and choose whether to crop the picture to fill the screen, fit the picture to the screen, stretch the picture to fit the screen, tile the picture, or center the picture on the screen. Tap on Desktop Back round & Choose your Wall papers. Then Choose your Favorite Picture as Wallpaper. Hit Save To Make your Changes Stable. 4) In Display, there are many options in left side. Choose "Change desktop background"
5) Here you go, now browse your picture and then click ok.
6) You can set your picture position by clicking the button "Picture position". 7) After all these stuffs click "save changes". Right click on your desk select the option " personalize " from the options that you see than select the option " Select Desktop Wallpaper " and then select the picture you want to select if you are not satisfied with that then click on the button " brows ' to select the type of picture or slide you may have saved in your PC and after selecting the image click on the button select and then " Save Changes " to apply on your PC . * Select "SET AS DEDKTOP BACKGROUND"
Done..!!! It is that Simple..Whooh..!! You have learnt the two simplest methods here..!! 3. Click on the Desktop Background link at the bottom of the window. 4. Select the picture location form either drop down and picture folder. 8. Close the Personalize window when done. STEP 1: Right - Click on the Desktop and Select "Personalize". STEP 2: Click on the "Desktop Background" which is at the Bottom of the Window. STEP 3: Now, Select the Picture from the Drop Down Menu or Click on "Browse" to Select the Picture from your Folders of your Interest. STEP 4: Right - Click on the Picture or Check on the Upper Left Corner of the Picture to Select it as the Desktop Wall Paper. STEP 5: From the Drop Down Menu of the Picture Position, Select the Position which you want for the Desktop Wall Paper. STEP 6: You can make the Slide Show of your Desktop Wall Papers. It changes for Frequent of time. It looks good if you have many Desktop Wall Papers. To know how, Click Here. STEP 7: Click on "OK", to apply Changes. STEP 8: Close the Personalize, when you are done. click on "change desktop background"
and choose the image you want. and go to the location where your image file exist select the file click on ok.
and then click on save changes. 1)Click on the Start button , goto Control Panel, click Appearance and Personalization, goto Personalization, and then click on Desktop Background. 2)Click the picture or color you want for your desktop background. 3)Lastly check how you require the picture to be positioned, choose to have the picture fit the screen, tile, or be centered on the screen, and then click OK.
5:After that, you will notice so many pictures they are Windows wallpapers! 8:Finally click on, select all to show all your selected walls as your desktop wallpapers! Setting wall paper to desk top. Right click on desk top. And chose and set Desktop wallpaper set it. Setting up Desktop wallpaper for windows 7 Computer is a very easy process. :::::: Then click on OK button. 2.There you make a right click on the desktop. 3.Then you make a click on 'Personalize'. 5.There you go to the 'desktop background' tab. 6.There you can able to see many backgrounds. 7.From that select the background which you like. you can change your desktop background in your windows 7 whenever you want. you can also download the any theme from any website and also can set as your desktop background in your window 7.
you can also set any picture as your desktop background. --> choose any backgroudn which you want to set as your desktop background. --> click on "save changes"
--> select "set as desktop background"
3~A new pop-up window will appear. 4~There you can personalize your desktop wallpaper and set the wallpaper as per your desire. The video below will be helpful to understand properly. >>right click on the wallpaper that you want to set >>click on "set as desktop background"
2.Then go to personalize option. 4.There you can personalize your desktop wallpaper. select the desired wallpaper you wish to apply and then clikc on "Apply". The following is the procedure for solving the problem of setting up desktop wallpaper for Windows 7 computer. At first you have to go to the desktop by pressing the right click. There the screen shows you the window which is of new one. After the option of 'desktop background' is to be tapped. Now the screen shows you the various types of backgrounds. Then you can select the background which you want according to your choice. After you can press the OK option. 7->>>. save he changes and apply the changes. now the setting up wallpaper compleated on window 7. >>Finally click on "save change"
>>select "Set as desktop background"